For almost 3 years, 2006-8, I spent about half-time traveling on a bicycle. It's a wonderful way to go: simplicity, freedom, intimate connection with the natural world and with people along the way. And then it was time for a change . . . maybe a comparable sort of travel on water? 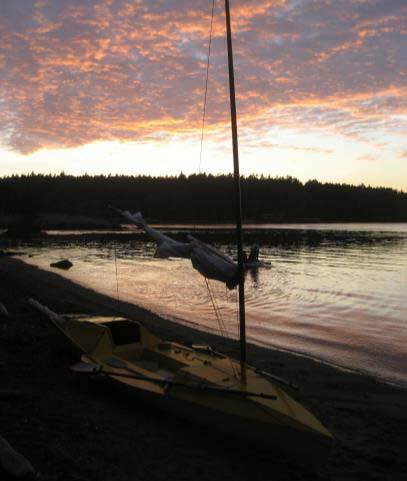 Surfing the web, I learned about ocean rowing boats and sailing canoes. I read Fredrick Fenger's 'Alone in the Caribbean' and realized: "I want a boat that can do that!" I flew to Florida to explore by bicycle and kayak, but mainly to meet Hugh Horton and see his Bufflehead. Hugh didn't make it to Cedar Key that winter, but he put me in touch with Charlie and Pat Ball who gave me the chance to sail and paddle Charlie's Canoodle, and see Pat's Bufflehead being built. Though it's a wonderful design, I realized it wasn't what I wanted. Their friend Peter introduced me to sliding-seat rowing. I was narrowing in on the concept. 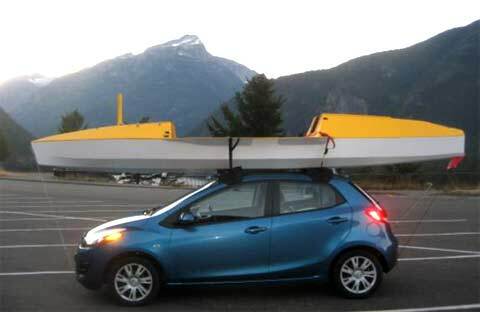 The boat would be small and light enough to haul behind a bicycle and easily drag up on a beach. She would be seaworthy enough to go almost anywhere, maybe even across oceans. 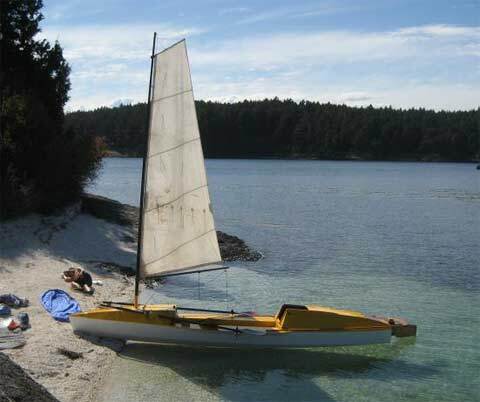 She'd be fun and fast sailing (like my old Capri Cyclone racing dinghy). Sliding-seat rowing would provide aerobic exercise and reasonable speed when the wind didn't blow (at least as fast as a sea kayak). There'd be a cabin so that I could find an anchorage, throw over the hook, and be settled for the night (as I had on an old Venture 17). For several years I played with designs. I found information on the web and received support and advice on forums, by e-mail and in-person from many knowledgeable folks. Phil Morrison, designer of ocean rowing boats, racing dinghies and other interesting craft was particularly helpful. Several times I almost started building, but backed off for one reason or another. This was getting ridiculous! Time to do it or let it go! December of 2011 I settled on a design, the narrowest to date. Hull shape is roughly based on the IC-10 international racing canoes, but double chine to make it easy to build without compromising performance too much. Aft cabin, self-draining cockpit and forward storage compartment make her a bit like a skinny, shallow ocean rowing boat. Under-cockpit storage for water and other heavy stuff should make her self-righting if properly loaded. I bought cheap, thin plywood from my local lumber company and ordered fiberglass, epoxy, tools and supplies on-line. I found Pygmy Boats You-Tube videos on stitch and glue construction a great help since I had no experience with this. Old wind-surfer masts, salvaged sails, stainless hardware – with help from my friend Julia it all came together in my yard once the snow melted and it warmed enough for epoxy to cure (mid-May). Installing the decks, I decided to extend them beyond the hull on either side, for better hiking out. I supported these "wings" with shaped foam underneath, covered with a layer of glass. 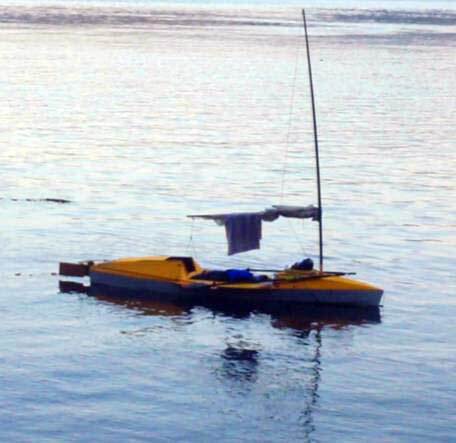 Test sails on a local lake led to other modifications (yoke with push-pull rods rather than long tiller, better sheet arrangement, etc). 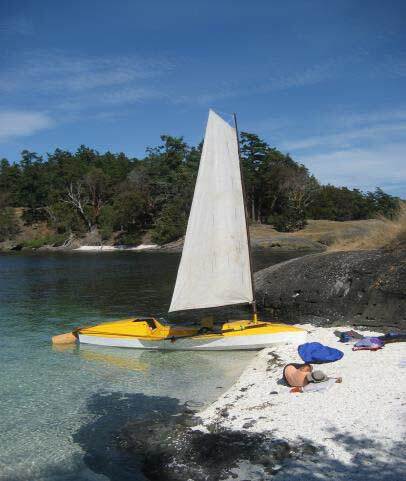 On August 19 we launched in Anacortes for a cruise in the San Juan Islands and Puget Sound. We visited Port Townsend for the Wooden Boat Festival where John Welsford, Howard Rice, Meade Gougeon and others looked her over and made excellent suggestions. We rowed through the locks and sailed into Lake Union for a few days in Seattle with nights tied to a dock at the Wooden Boat Center. I borrowed a drill and added a boom-vang. The Marsh Duck did everything I'd hoped for! Though intended as a solo cruiser, she accommodated 2 for the first 4 weeks. We slept aboard most nights, sometimes pulled up and leveled on the beach but more often at anchor, occasionally tied to a dock. We experienced the anxiety of long crossings in an untried boat, gained confidence and became more relaxed day by day, anchored in quiet coves for the night. We tied to docks and shared food, music and conversation with other cruisers in much larger boats. Dinners cooked on a one-burner propane stove were served on the side decks as we sat comfortably facing each other from either end of the cockpit. There were glorious sunsets, a canopy of brilliant stars. We enjoyed close encounters with seals, otters, porpoises, and myriad birds. A sea lion, as big as the boat, erupted from the water 20 feet away with a large salmon in his jaws. 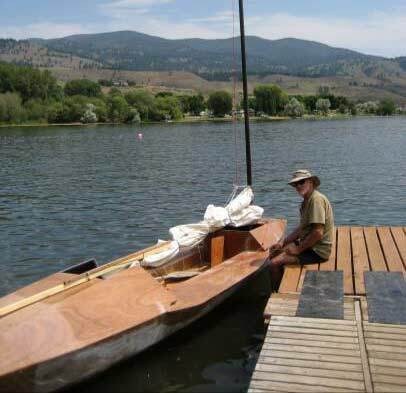 I rowed at 3 to 4 knots, comfortably, for hours at a time (at 64, a novice, with back problems). With 56 square feet of sail, in wind so light as to be barely felt without a ripple on the water, we'd sail at a relaxed walking pace. Once I gained confidence and was cruising alone (the last 2 weeks), I was less cautious. Coming about, a gust hit and knocked her down enough to bury the lee wing, but no water came into the cockpit, and she popped right back up and continued on the new tack. At the end of the cruise I finally experienced the racing dinghy style sailing I'd imagined. I spent the day crossing the Strait of Juan de Fuca, then started down Admiralty Inlet. The wind suddenly rose to a predicted 20-25 knots. I decided on a 270-about rather than risk a jibe that might dump me into that very cold water after a long day. And then I was hiked out, screaming along on a broad reach less than 100 yards off the beach, heading for Keystone Harbor for the night. I'm sure we were doing 15 knots, probably more. What a thrill! I used a HandiRack on a small rental car to bring her home, 200 miles over mountain passes. I'm now making a 110 square foot sail with better shape, full battens, and quick, easy reefing. 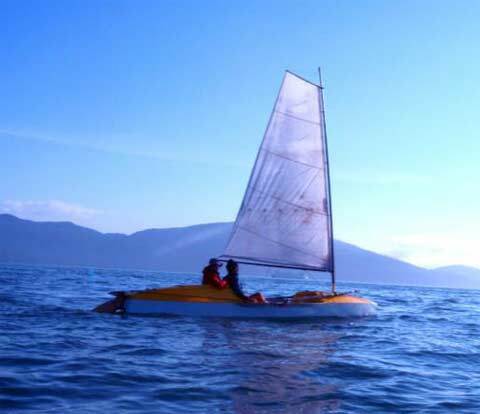 It should make racing dinghy style sailing possible in a wide variety of wind speeds. Come spring I'll make a few other improvements, try some long over-due capsize-testing, and explore the Duck's limits in a range of conditions – hopefully in warmer waters so I won't mind an unintended swim. And summer? Who knows? Perhaps the Inside Passage to Glacier Bay? Then south down the pacific coast for winter in the Sea of Cortez? See scotdomergueblog.wordpress.com for continuing adventures with the Marsh Duck.